“Library Lot” in downtown Ann Arbor. The “Library Lot” is currently used as a parking lot. A panel discussion on Proposal A was held at the downtown Ann Arbor Library branch on October 25th. Proposal A panel discussion speakers. Linh Song and Jessica A.S. Letaw spoke against Proposal A at the panel discussion. Alan Haber and Will Hathaway spoke in favor of Proposal A at the discussion. Over 130 people attended the panel discussion for Proposal A. The panel discussion was hosted by the League of Women Voters of the Ann Arbor Area. Residents who support Proposal A stand in line to speak at the panel discussion. Residents who are against Proposal A stand in line to speak at the panel discussion. Ann Arbor residents attend a panel discussion on Proposal A at the downtown Ann Arbor Library branch. On the surface, voters are being asked to choose between an urban park and civic center and a mixed-use high rise with a public plaza. "What we’re aiming for is more than just a park, we’re aiming for more of center for the city." That is Will Hathaway. He’s a leader of the Ann Arbor Central Park Ballot Committee, which is campaigning for passage of Proposal A. Opponents contend there are long-term consequences of the urban park idea. That is Jen Eyer. She is putting her public relations skills and extensive background in local journalism to work as volunteer spokesperson for “Voters for a Responsible Ann Arbor.” That group is leading the “Vote No on Proposal A” campaign. EDITOR'S NOTE 11/05/2018 09:30 am - Jen Eyer's background as a public relations professional was not included in the original piece as aired on WEMU. What exactly is in play? The city-owned property is nestled just north of the downtown library branch along Fifth Avenue and bounded by William, Division, and Liberty Streets. It sits atop the “Library Lane” underground parking structure. City officials say, in total, the property covers just over an acre and a half. About .8 of that qualifies for development. 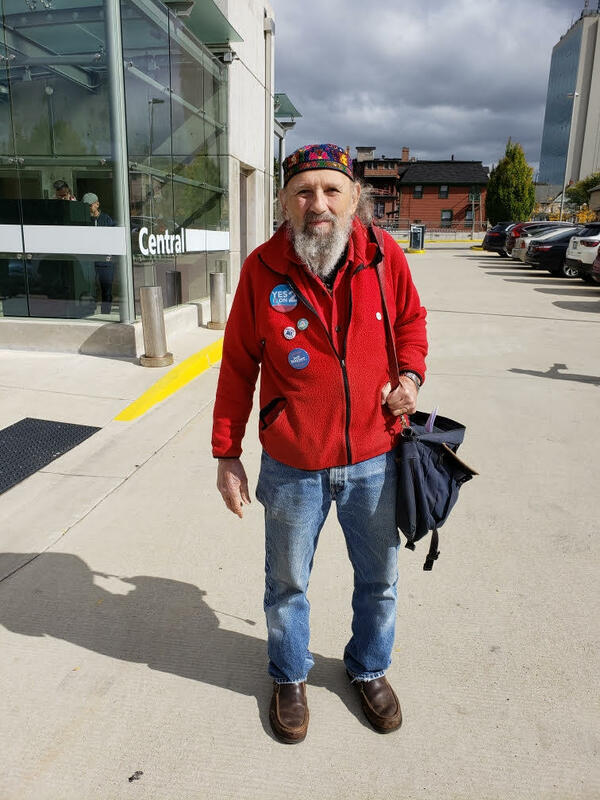 Alan Haber is a member of Ann Arbor Committee for Community Commons and was a driving force in getting the Library Lot proposal to the ballot. What does he envision the future of the property? Alan Haber, Member of the Ann Arbor Committee for the Community Commons. Supports Proposal A.
That’s not at all what Ann Arbor City Council envisioned back in April when it voted to authorize the sale of the Library Lot development rights. Chicago-based developer Core Spaces has plans to construct a 17-story building that would include retail space, a hotel and office space. “The Collective on 5th,” as it's being referred to, would also include a number of apartments, some of which would be dedicated workforce housing. And, it would contain a 12,000-square-foot public plaza. Linh Song is an Ann Arbor District Library board member. The library board unanimously opposes Proposal A. With the over 600,000 visitors the library gets each year, Linh says there is benefit to the mixed-use development plan. 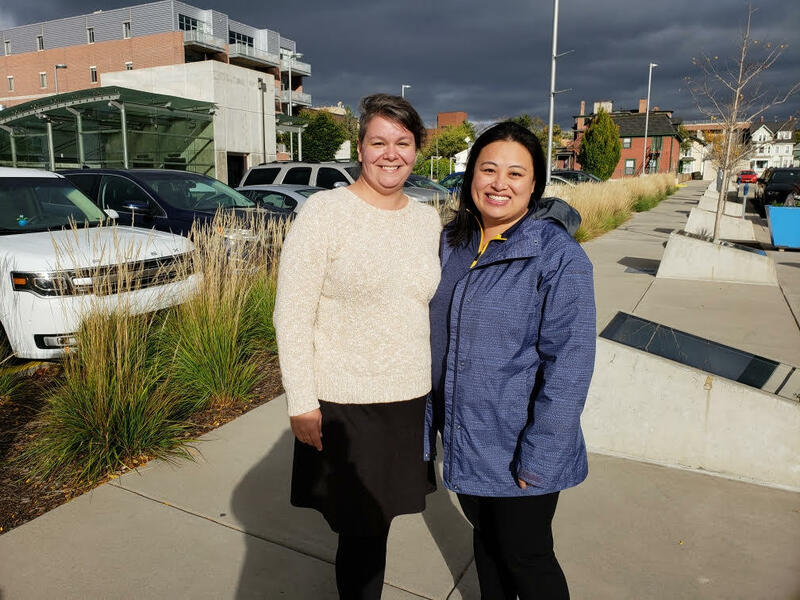 Jessica A.S. Letaw (L) and Linh Song (R) from Welcoming Ann Arbor. They oppose Proposal A. "If this space is activated, which is, I guess, this urban planning term, with a hotel and a conference center, I think it would not only potentially meet some of the library needs, but also the demand on wanting to host things in a really vibrant city." EDITOR'S NOTE 11/02/2018 2:50pm JA: After this article was published, Linh Song e-mailed WEMU letting us know she misspoke. There would not be a conference center on the site. To supporters of Proposal A, that’s part of the point. The city is already vibrant. According to Hathaway, a town-square, community gathering-place will only add to the city’s vitality. "We don’t need to sell our public land in order to get development. We have plenty of development going on and there is no shortage of new revenue from downtown development, there’s lots of towers going up. So, this is not some kind of desperate need. This is really sort of a project of some people in the city who would like to see even more development that we already have." So what do residents think? 26 year-old Whit Froehlich is a medical student at the University of Michigan. He says “The Collective on 5th” development better suits his future needs. Whit Froehlich opposes Proposal A. "Living downtown is quite attractive. You have access to downtown services, you have access to downtown businesses. This is a busy part of the downtown and adding more people would make it even busier. 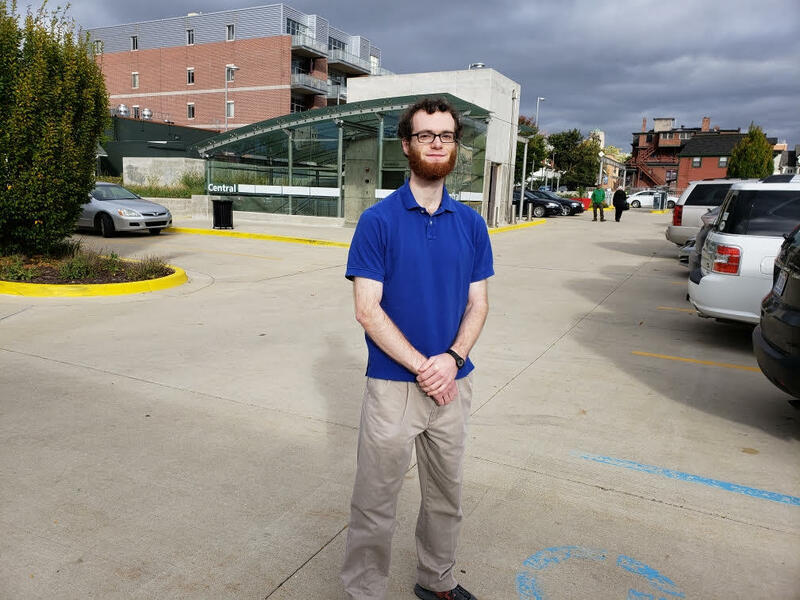 So certainly, I would be more inclined to live in downtown Ann Arbor knowing that I would have new neighbors, knowing that if I lived here myself, I would have easy access to everything the city has to offer." At a recent public forum on Proposal A, WEMU spoke with other voters that shed light on the different values that make this such a divisive issue. Odile Hugonot-Haber plans on voting for Proposal A because of, what she believes to be, a lack of adequate public space in the area. 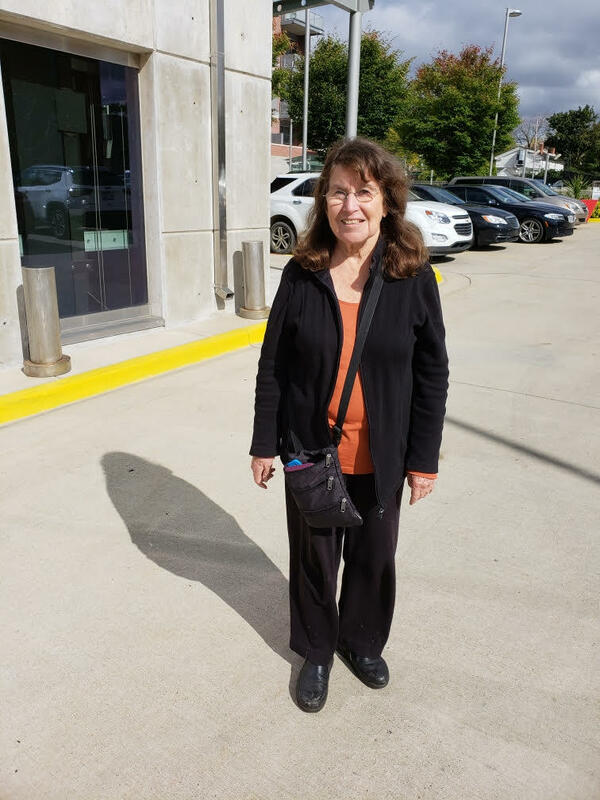 EDITOR'S NOTE 11/05/2018 09:30 am PC - Odile Hugonot-Haber was not identified by her full name in the original piece, as aired on WEMU, and her relationship to Alan Haber, her partner, was not disclosed. Odile Hugonot-Haber supports Proposal A. "There is no place to go downtown where you can sit on a bench, take in a water fountain. People could play a little band, a little theatre and children could play on the playground." Core Spaces recently announced it would up-the-ante and contribute more money to the development of a public plaza for its proposed development. It had already committed $25,000 annually for programming. Corporate spokesperson Jeanette Smith confirmed Core Spaces will spend another $100,000 on the plaza, if the development becomes reality. "This is something that was already talked about internally to make the public plaza really dynamic, now, it’s just that we got corporate approval for it." Will Hathaway of the Ann Arbor Central Park Ballot Committee questions the timing of such an announcement so close to election day. "I’m not that cheap. You can’t buy my vote that way." When it comes to the affordable housing issue, Alan Haber says city officials need to adapt and change policy, not sell off what little remains of the city’s open space. Jessica A.S. Letaw is part of the community organization “Welcoming Ann Arbor.” That group is part of the “Vote No” campaign.” She is also a sitting member of the Ann Arbor Downtown Development Authority Board. While the DDA is not taking a formal stance on Proposal A, Letaw says the Core Spaces plan would generate a good deal of revenue for the city beyond the sale price. "Conservative, but pretty peg-on estimates, estimate that the project will generate approximately $2 to $2.3 million in taxes every year. That includes taxes that go to the Ann Arbor District Library, the public schools as well as basic services, like roads, fixing the potholes and improving our public safety." "Actually, we’re in a very sort of ironically enviable position for a park, because located in the downtown, we can draw on the funds of the Downtown Development Authority." Is that true? Ann Arbor Mayor Christopher Taylor says, technically, DDA money could be used for some of the urban park project. But, DDA board member Joan Lowenstein says it’s unlikely. "The DDA is not just an ATM for any idea that comes up in the downtown. The mission of the DDA is to provide infrastructure that will enhance economic development within our downtown district. So economic development to our infrastructure was the underground parking garage at Library Lane. We built the parking garage so that we can encourage development of something on top and that something was going to be a multi-use building." Alan Haber says there are other options for funding. There is also the matter of politics. When city council agreed to sell the Library Lot’s development rights, the vote was 8-3. Mayor Christopher Taylor was among those leading the push. At a Prop A public forum, voter Frank Wilhelme told WEMU the mayor has ulterior motives. "He and his council allies have spent over a million dollars on the proposed train station. They don’t know where dollar one is coming for the $85 million construction of that train station. The Treeline project, the green corridor around the downtown, that doesn’t have permit funding. So, he is very selective on what he will back and how he presents it." Mayor Taylor says there are significant differences in his approach to city projects and the way Proposal A supporters are operating. "I am not proposing that we amend our city charter to obligate the city to build a train station. I am not recommending that we change our city charter to obligate us to build a Treeline. If you’re going to include an obligation to develop an area to retain an area for a civic commons, there needs to be funding for it and there simply isn’t any funding here." Now the question becomes, what happens after voters render a decision on November 6th? Community Commons spokesperson Alan Haber says that some of the mayor’s allies won’t be there post-election. "The election in August changed the dynamic, when the Democratic Party, when the mayor’s group was not able to keep their people in office. Kurt Westphal was defeated. The person they put up in the first ward was defeated, Chuck Warpehoski, who was sure he was in, he was defeated, and Graydon Krapohl in the fourth ward was defeated by new people." "I am uncertain as to the language’s legal effect. It would certainly be possible for Core Spaces to seek to have the language invalidated if they came to the conclusion that it was somehow improper. So, I guess if Proposal A passes, there will be a high level of uncertainty and we’ll see what happens next." Core Spaces issued a statement to WEMU that it would internally discuss its options before deciding what to do, should voters pass Proposal A. If it is defeated, it doesn’t mean a high-rise will suddenly pop up. There is still a pending lawsuit on the matter. City council members Anne Bannister and Sumi Kailasapathy sued the city, Mayor Taylor, and City Clerk Jackie Beaudry over the Core Spaces agreement. They contend the sale of the Library Lot development rights was illegally executed. The arguments have been heard in Washtenaw County Circuit Court, but it is unclear when Judge David Swartz will issue his ruling.